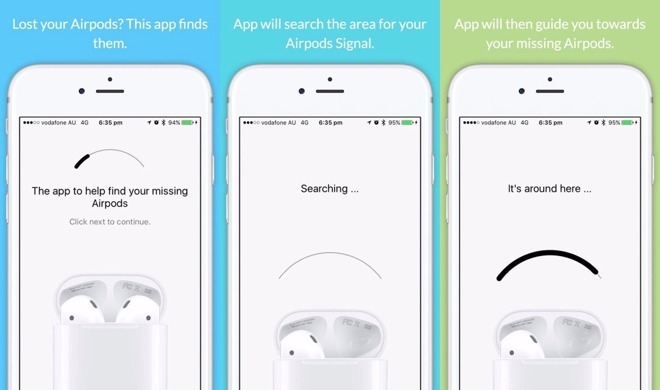 Developed by Deucks, the app worked by monitoring the strength of the Bluetooth signal transmitted by the lost AirPods. After selecting which AirPod is missing and docking the other in its case, users are then given an arc-shaped progress bar to show how strong the signal is, with the bar progressing to the right the closer the iPhone gets. Posting on Reddit, a developer behind the app advised they had been in contact with Apple, and though there wasn't anything functionally wrong, Apple "didn't like the 'concept' of people finding their AirPods," deeming it "not appropriate for the App Store. Apple has yet to publicly give a reason for why the app was removed from the App Store. AppleInsider has contacted Apple for comment. Normally sold as a set for $159 in the U.S., Apple is currently charging $69 to replace a single lost AirPod or the charging case, making the $3.99 app seem like a cheaper alternative. Despite the potential market, the app does have some limitations that may disappoint some users. Finder for AirPods relies solely on Bluetooth transmissions, which means it cannot find an AirPod if the battery is dead or if it is out of Bluetooth range entirely. The detected signal strength also doesn't take into account nearby objects, walls, and floors, making the reading inaccurate.